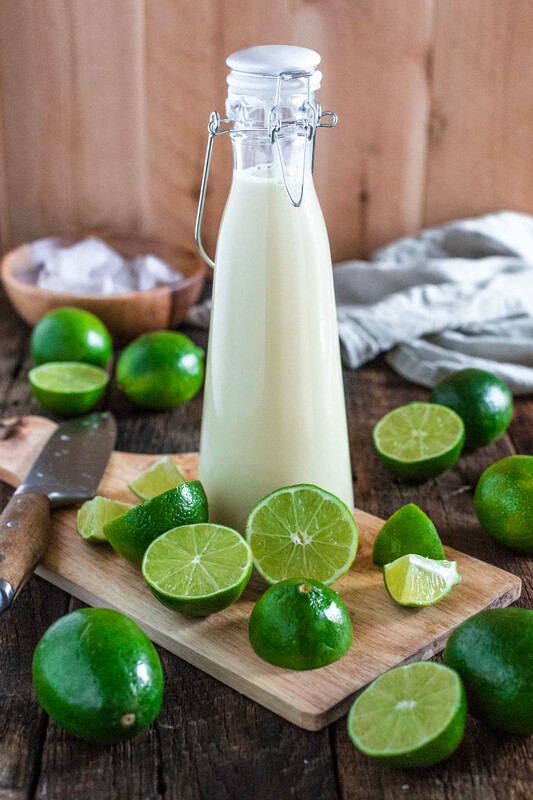 Brazilian Lemonade is the creamiest and sweetest lemonade you will ever try! It is like summer in a cup! Lemonade? But where are the lemons? ??? Well, there aren’t any really, because Brazilian Lemonade is usually made with limes. But then, shouldn’t it be called “limeade”?, you might be asking yourself. I guess it could, but it usually isn’t. 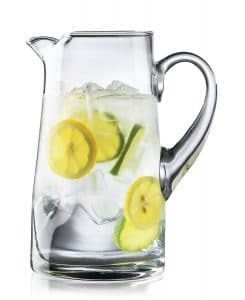 Here’s the deal: you can call it whatever you want and you can even use lemons instead of limes in your lemonade. Whatever makes you happy! So let’s talk about what makes this lemonade (limeade? potato, potahto!) so special. And the answer is: sweet condensed milk! Yes! 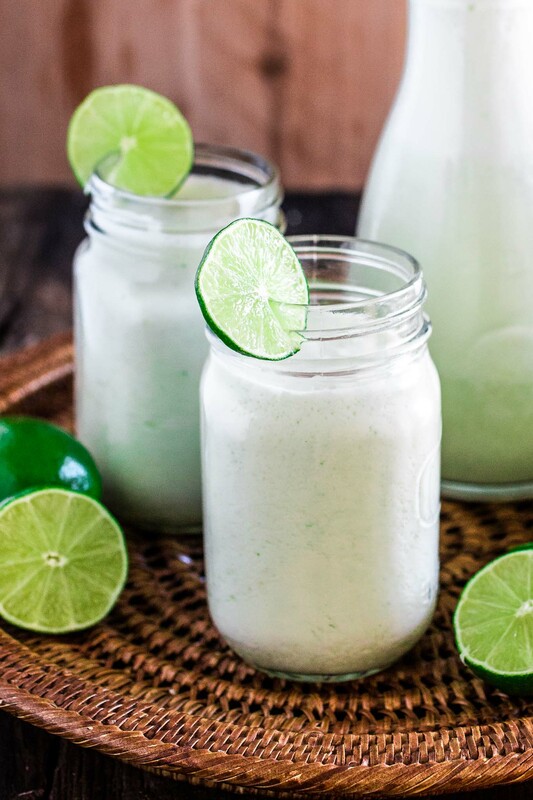 Brazil’s favorite ingredient is here again, making this lemonade a very sweet and creamy, almost smoothie-like treat. If you go to any restaurant in Brazil and you ask what is the best selling non-alcoholic drink, the answer is going to be…. Guaraná, Brazilian’s favorite soda. But Brazilian Lemonade, or Limonada Suíça (which translates to “Swiss Lemonade”), comes in a close second! However, even though Brazilians call it Limonada Suíça, you won’t be able to find a similar version in Switzerland. But why the name, then? Honestly? Nobody knows! ? It’s another mystery, just like the “Torta Holandesa” (“Dutch Pie”) or the Portuguese Pizza. Both are insanely delicious, but the titles make no sense whatsoever. I guess you can say Brazilians are weird. Myself included! Now, you will find a thousand and one versions of Brazilian Lemonade on the internet. Some of then call for a few tablespoons of sweet condensed milk and some omit it all together. DO NOT TRUST THESE PEOPLE!!! ? The real Brazilian Lemonade will take a whole can of sweet condensed milk. 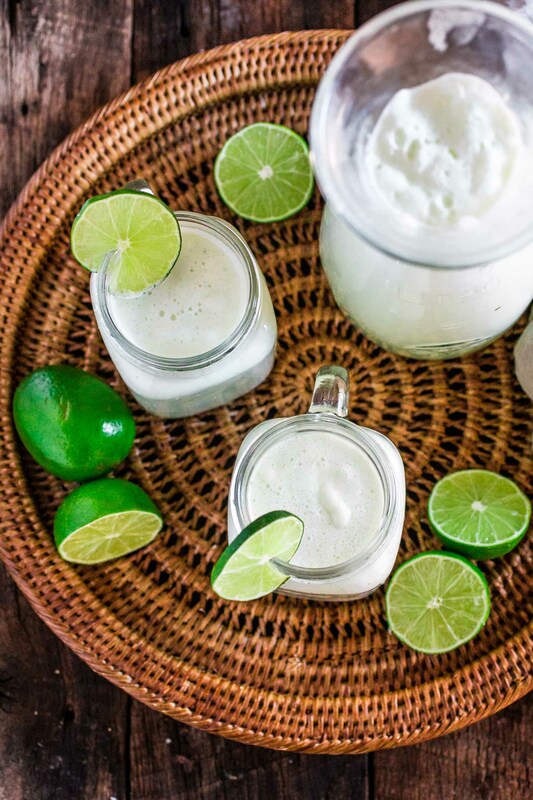 I know it might sound excessive and overly sweet, but since we leave the lime’s peel in most of the limes, it ends up being necessary so you don’t end up with a bitter drink. Another trick to prevent bitterness is to blend the limes and water for only 10 seconds. That’s it! No more. It is enough time to extract the juice and some of the bitterness from the peel. Any more than that and you won’t be able to drink your lemonade, even if you add five cans of sweet condensed milk! Also, the fresher the limes, the better. And, even though we are leaving the peel in some of the limes, you gotta cut off the white part from the inside. That’s where most of the bitterness is and it does not belong in our awesome drink. So, what did we learn today? 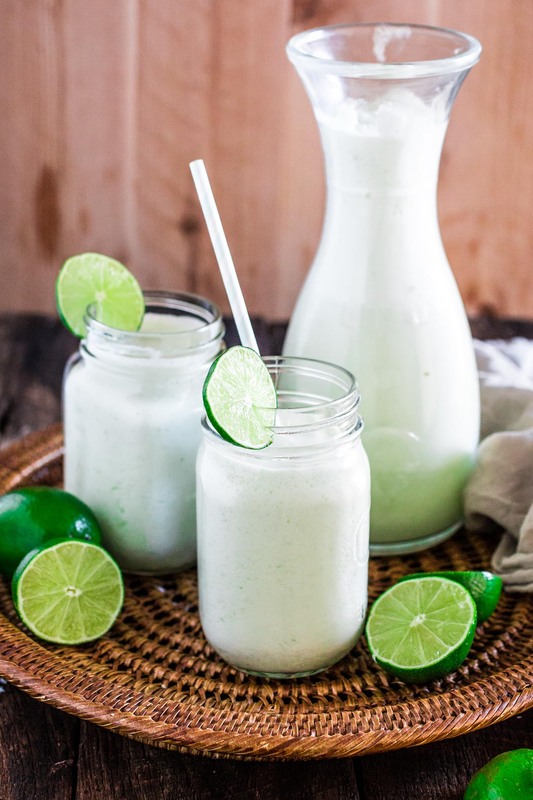 If a recipe omits the sweet condensed milk or asks for mint, ginger or honey, that is not a Brazilian Lemonade, or at least not the Limonada Suíça kind. That’s another kind of lemonade. Delicious? Maybe! But it’s not the “suíça”. Oh, but what if I want to add alcohol? Then, it is called “batida”. But we’ll get to that on a future post! ? P.S. After all I said on this post, feel free to do whatever you want to your Brazilian Lemonade. If you’re not into sweet drinks, add less sweet condensed milk. If you’re not into a slight bitterness, peel all the limes. And so on! What matters, at the end of the day, is that you make a drink that you’ll love! Wash your limes and peel two of them. Cut them into 8 wedges. and remove the white pith. 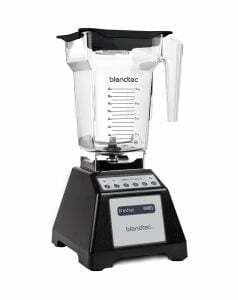 Combine the lime wedges and water in your blender's jar and pulse for a few seconds (10 seconds maximum). 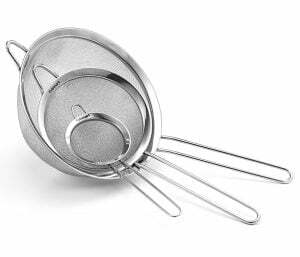 Strain the juice through a fine-mesh strainer, pressing on the pulp to extract all the juice. Feel free to adjust amount of sweet condensed milk to your liking. Disclosure: This post might contain affiliate links. You’ve had me on lemonade. When you added the condensed milk, I was all in. I’ve got a sweet tooth, So that’s my next project. I am a lemon and lime user, I think I go through 20 to 30 a week. I put them in my water, over salads and in desserts. This is a recipe I will be giving a try. Oh Lori! That’s amazing news. Thank you for taking the time to leave some feedback! :) I am very glad that even your picky eaters like Brazilian goods! Hi! This looks so good, is there any similarities between Brazilian food and American food, or what are the major differences? Is there any chance I can make this ahead of time, like, the night before and then keep it in the refrigerator? It says to peel and wedge two limes.. what are the other two used for? How long can this lemonade stay out of the fridge until it goes bad? Hi. Love the recipe. But I have a question. Since I am lactose intolerant what can I use instead of condensed milk? Lovely recipe. How much grams or ml are in one can of condensed milk? Would vodka go well with this forvan adult twist?